Swaraj has been the target of offensive tweets for helping Tanvi Seth, wife of Mohammad Anas Siddiqui, get her passport after an officer allegedly harassed her for not changing her name to a Muslim one after marriage. Although there is nothing to suggest that any or all of the abovesaid 41 BJP parliamentarians endorse the tweets posted against her, the proximity of the ‘hate trollers’ and the Twitter accounts of these BJP MPs and ministers, including the prime minister, tell a story of its own. On July 3, Sidharth Bhatia wrote in The Wire that Swaraj’s “polite response means that she chose to swallow the insults”. The same day, Swaraj directly hit back at a troll. When one of her critics asked her to do her a favour and block her on Twitter, Swaraj shot back in Hindi “Why wait? Here you go, you’re blocked”. The BJP came out with a delayed and weak defence of Swaraj when its national general secretary Ram Madhav wrote a piece in the Indian Express on July 6. Madhav is clear that trolling Swaraj, a champion of nationalism, on the passport issue is unacceptable, and also admits that the trollers are from the same side. Yet his main grouse seems to be why the trollers have let got the “regressive Muslim cleric” who performed the nikah and forced a Hindu woman to change her name. In another piece in the Indian Express on July 10, Apoorvanand looks at the issue ideologically and concludes that the trolls that target Swaraj are a byproduct of her and her party’s politics. A few words on who is Sushma Swaraj (nee Sharma) might be relevant. Born in Ambala, Haryana, her father was a prominent RSS member hailing from Lahore. She began her political life with the ABVP but was influenced by her husband and colleague in the legal profession, Swaraj Kaushal, who was a socialist by conviction and closely associated with the socialist leader George Fernandes. This took her to active participation in JP’s total revolution movement and the legal defence team for Fernandes in 1975. After the Emergency, she joined the BJP and soon became one of its prominent national leaders. Since then she has twice been an MLA in Haryana and the youngest ever cabinet minister in the country at the age of 25. She has been chief minister of Delhi for a brief period. She has been a member of parliament for seven terms, leader of the opposition in the 15th Lok Sabha and Union minister in-charge of important portfolios like information and broadcasting, health and now external affairs since May 2014. 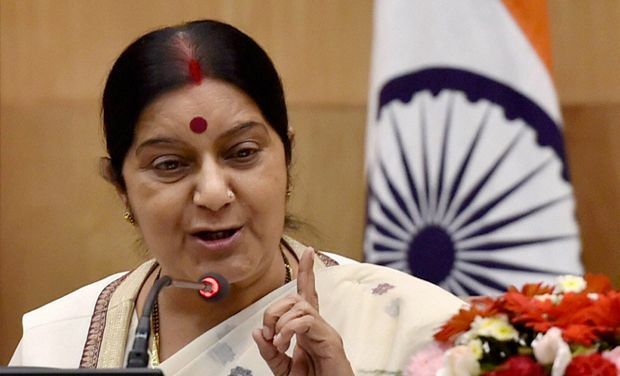 After taking over the MEA, Swaraj has been virtually reduced to the handling of overseas Indian affairs with foreign policy being exclusively handled and directed by Prime Minister Modi and his cohorts NSA advisor Ajit Doval and, till recently, foreign secretary S. Jaishankar. She has done the job allocated to her well. By creating the ‘Twitter Seva’ service and now the passport seva mobile app she has helped thousands of Indian citizens in difficulty abroad. The passport seva mobile app, which allows migrant applicants to apply for a passport from their original place of residence, was launched on June 27 and by June 29, there were one million downloads. As recently as July 11, Swaraj tweeted that she was hearing only harsh language these days, a comment which means that she continues to be the victim of vicious and bitter trolling. No wonder, communication firm Burson Cohn & Wolfe concluded after a survey, that she is the most followed female world leader on Twitter with more than 10 million followers. It is clear that Sushma Swaraj’s response to the bitter trolling was not only firm but also reflected her determination to uphold the passport rules rather than succumb to the coercion of communal trolling. She thereby upheld the Rule of Law, rather than the rule of the mob. She stood up to Modi and his loyalists and showed him who is the real external affairs minister. By holding a surprise Twitter poll on trolls where she secured a majority, she demonstrated her popular base. By getting support from her cabinet colleagues and political leaders from different parties, she proved that she commands respect.